Try this dish with Better Than Bouillon Reduced Sodium Roasted Beef Base. SAME COOKING TIME AND TEMPERATURE APPLIES WHEN USING A CONVENTIONAL OVEN. Preheat the Big Green Egg® to 425°F. Set the EGG® for indirect cooking with the place setter and the porcelain grid. 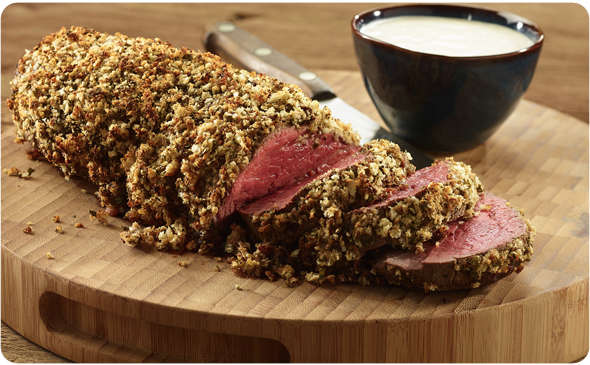 Rub the beef tenderloin with the Roasted Beef Base and sprinkle with 1 teaspoon of the black pepper. Add the oil to a large sauté pan over high heat. Carefully place the tenderloin into the pan and sear for 1 - 2 minutes on each side. Remove the tenderloin to a baking sheet. Combine the horseradish, panko, garlic powder, 1 teaspoon black pepper and parsley in a small bowl. Coat the top and sides of the tenderloin with the panko mixture, pressing gently to adhere. Place the tenderloin directly onto the porcelain grid and roast for 20 - 25 minutes or until the tenderloin reaches 125°F when checked with an instant read thermometer. Remove the tenderloin from the EGG and let rest for 10 minutes before slicing.